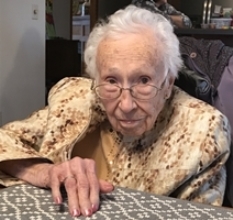 IRIS R.”SUNSHINE” PEAVEY, 97, of Jasonville, Indiana passed away at 7:29 a.m. Friday, January 18, 2019 in her residence. She was born June 30, 1921 in Greene County, Indiana to George and Audrey (Henney) Pope. Iris married George T. Peavey on March 21, 1948 and he passed away on September 20, 2012. Survivors include her daughter, Beth Wolf of Jasonville, daughter-in-law, Val Peavey of Houston, TX; grandchildren, Traver Wolf (Paige), Michael Peavey (Chantelle), Brandon Peavey (Kirsten), Tara Secrest (Joe); great-grandchildren, Jaycie Peavey, Bailey Peavey, Elyssa Secrest, Katie Peavey, Emmalyn Wolf, Brennan Wolf, Kamryn Peavey and Archer Peavey; sibling, Kay Wall of Anderson; several nieces and nephews. She was preceded in death by her parents; husband, George Peavey; son, Fred Peavey; son-in-law, Tom Wolf; siblings, Shirley Johnson, Keith Pope and Gayle Spainhower. Iris was a 1939 graduate of Midland High School. Iris was a member of Lebanon Baptist Church but was currently attending Howesville Community Church. She was a homemaker and played piano at church as well as countless weddings and events. Arrangements are entrusted to Michael W. Cox, Cox Funeral Home; 218 South Meridian Street; Jasonville, Indiana. Visitation is scheduled from 10:00 a.m. to 1:00 p.m. Saturday. Funeral services will follow visitation at 1:00 p.m. Saturday, January 26, 2019 at the Cox Funeral Home with Pastor Chris Elmore officiating. In lieu of flowers contributions may be made in memory of Iris R. Peavey to the Howesville Community Church. Envelopes are available at the funeral home.